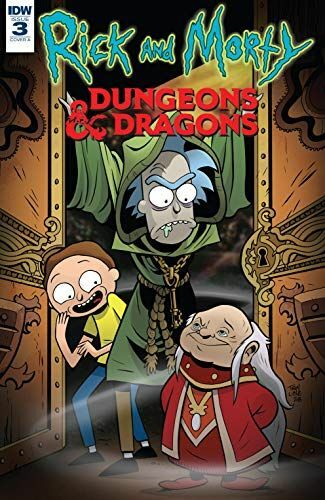 A dimension where the Dungeons & Dragons paradigms are real. The rules are absolute... or, at least, they were... until Rick and Morty make their mark. Get ready to plead the fifth (edition) in this unlawful, chaotically evil story of family friction and fantasy frolics. The world's greatest roleplaying game. Reality's most dysfunctional animated series. What could go wrong? Presented in conjunction with Oni Press! Patrick Rothfuss, the multiple award-winning, bestselling author of The Kingkiller Chronicle series, joins Dungeons & Dragons fan-favorite author Jim Zub (Avengers, Wayward) on a tri-dimensional fantasy adventure! Rick and Morty is one of the most popular shows in Adult Swim history, with a steady fan following since it debuted in 2013. This is the first official Rick and Morty team-up story and should have deep traction in fan circles! Dungeons & Dragons 5th Edition sales continue to grow each year and the Baldur's Gate video games have sold millions of copies around the world. D&D has returned as a cultural force in bookstores and online.